Obtaining — as often as possible — the plate number, and a description of the vehicle and its occupants prior to activating your lights. Show that you do care about going home at the end of your shift by driving with “due care.“ Hopefully you have trained in the application of these skills before the incident. When your policy dictates or your commander orders it, you must terminate. Notify dispatch you are terminating the pursuit as you slow down. Shut your siren down when you reach a safe speed, then shut your overhead lights off. Pull over temporarily, and then you may resume patrol at the speed limit in the direction of the suspect&apos;s flight. Occasionally this will put you in a position to pull the driver out of his vehicle at the scene of his crash before he goes up in a ball of flames. Immediately and constantly assess the suspect&apos;s hands and gait to determine if he might be holding something like a weapon in his hand or tucked in his belt. If the suspect flees into a residence or building, remember these words: “Suspects do not run to where your friends and weapons are, they run to where their friends and weapons are.” Stop and set up a perimeter to hold him in place until you can orchestrate a legal arrest. Remember, the act of fleeing an officer is not a capital offense. You can&apos;t use deadly force unless the fleeing suspect&apos;s escape poses an imminent threat of death or great bodily harm to the community at large. Determine the suspect&apos;s direction of travel. Passenger(s) may be accomplices in the driver&apos;s crimes and be the proverbial bird(s) in the hand. 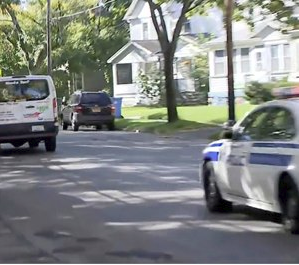 For the active street officer, it is imperative that when a violator chooses to engage in mindless flight, that officer&apos;s brain is totally engaged before, during and after the pursuit to ensure the end result is a pursuit of excellence. Lt. Dan Marcou is an internationally-recognized police trainer who was a highly-decorated police officer with 33 years of full-time law enforcement experience. Marcou&apos;s awards include Police Officer of the Year, SWAT Officer of the Year, Humanitarian of the Year and Domestic Violence Officer of the Year. Upon retiring, Lt. Marcou began writing. He is a co-author of “Street Survival II, Tactics for Deadly Encounters,” which is now available. His novels, “The Calling, the Making of a Veteran Cop,” “SWAT, Blue Knights in Black Armor,” “Nobody&apos;s Heroes” and “Destiny of Heroes,” as well as his latest non-fiction offering, “Law Dogs, Great Cops in American History,” are all available at Amazon. Dan is a member of the PoliceOne Editorial Advisory Board.